Next year my first book will be published. Cue excited clapping, champagne glass-clinking and general happiness. But first let me take a step back and tell you how this journey went, because it wasn’t, by any means, a short one. It was fraught with failure, rejection and, to be perfectly honest, a lot of me swearing I was done writing (only to then start up again because I just can’t give up and I just can’t stop writing). Date set for publication – Feb 2019. That’s almost 3 years after signing with my agent for this book, 8 years from when I first started writing. Writing a novel for traditional publishing is a long and arduous journey. It is the emotional equivalent of standing in a warzone. Rejections, long silences, criticism, put-downs, tempered with hope, anticipation and possibility. It’s really, really tough, and you definitely need a thick skin and a few renditions of ‘Let It Go’ to be okay with it all. My first go around with publishing was really difficult because I got all the way to the stage where my agent pitched my book to publishers, and that’s where it fell flat. My book wasn’t marketable enough. So when it came to my second go around (the third book I’d written), I was incredibly nervous. I did my research and made sure I queried the agents who would be most interested in my book. Getting my agent, Carly Watters, P.S. Literary Agency, turned out to be relatively painless. On her suggestion I did a lot of editing, but I was really proud of the end result. However, when she pitched my book to publishers the wait was excruciating. Every day was pretty raw. I was irritable with my loved ones, snappy and just incredibly prickly. I’d been at this stage before and had the book knocked down, and I didn’t think I could handle that again. But then it turned out there was not only one, but two publishers interested. I was deliriously happy. 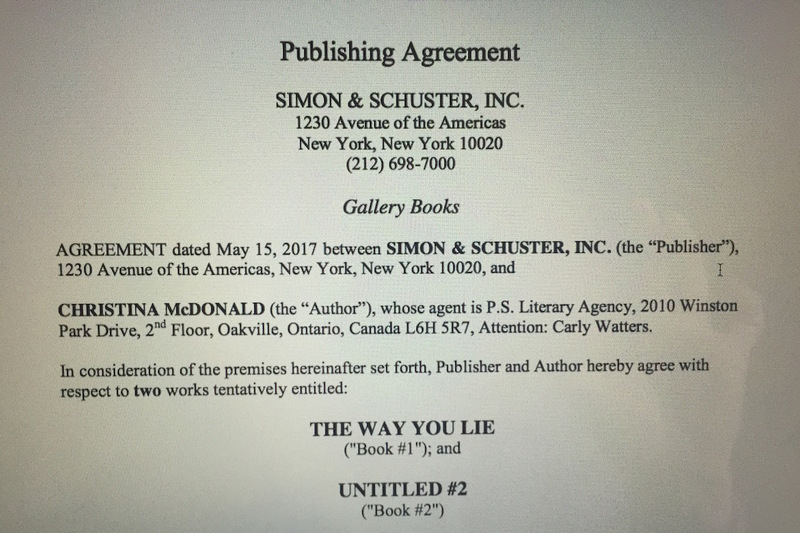 In the end I signed with editor Kate Dresser at Galley Books, an imprint of Simon and Schuster, because of her enthusiasm and vision for my book. My book still isn’t out, and after a publishing delay won’t be until January 2019, but I’m still incredibly proud of how far I’ve come, and so grateful I stuck it out. I really think there are so many talented writers out there, the difference is those who really wanted to be published didn’t give up. And in this industry, that holds especially true. It’s hard to wait, to pick yourself up and keep trying, but worse to regret not having tried in the first place.